A man who was shot and killed by Fremont police officers on Monday is accused of being armed and firing at them first, prompting the lethal response, according to the police department. 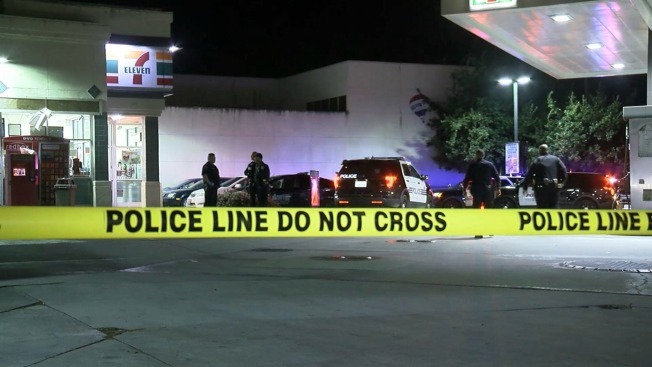 The chaotic scene — that spanned two crime scenes — began around 11:30 p.m. near a 7-Eleven at Decoto Road and Fremont Boulevard, police say. A clerk at the 7-Eleven told NBC Bay Area that a customer pulled a gun on another person in the shop. But the store's owner later said that the clerk was mistaken, and after she reviewed surveillance video with police, there was never a gun pulled inside the store. Someone at the store flagged down an East Bay Regional Parks District officer, who then called for emergency backup, police said. An officer-involved shooting occured overnight in the area of Fremont Boulevard and Decoto Road in Fremont, according to police. Damian Trujillo reports. Fremont police officers arrived at the 7-Eleven parking lot and approached the suspect, who was sitting a parked car. But the man fled, prompting a manhunt. Police also used a helicopter and a drone to search for the suspect, according to Fremont police spokesman Mike Gilroy. Investigators say officers finally confronted the man in a delivery port at a neighborhing Walgreens store. Luis Hernandez lives next to the scene and heard the commotion. “The authorities were trying to ask the subject to come out, by talking to him, telling him, ‘Everything will be OK. Come on out,’” Hernandez said. It didn't pan out that way, though. An officer involved shooting occurred this morning in the area of Fremont Boulevard and Decoto Road in Fremont, according to police. Damian Trujillo reports. "I heard two pops," Hernandez recalled. Fremont police officers then shot the suspect, killing him, according to police. It remains unclear how many officers fired at and struck the man. "The suspect did fire on our officers and our officers returned fire," Gilroy said. "A handgun was located at the scene." Police declined to comment on what might have led the suspect to fire at officers, but said investigators expect to release more details during the week. "That is going to be part of the investigation — what their observations were, what happened in that area," said Fremont police Sgt. Ricardo Cortes. Per department policy, the officers involved in Monday night's incident are on administrative leave. Police have not yet identified the officers or the suspect.